A compact and simple solution to poor cellular reception inside condos, apartments, dorm rooms, homes and offices, the PowerMax™ 4KPR-15R wireless personal cell booster provides reliable and clear cell phone communication equivalent to the cellular signal strength available outside the building. A simple do-it-yourself installation (no tools required) allows this repeater system to be installed in any room with a window. The 4KPR-15R provides clean and clear voice quality and improved air card performance on all carriers except Nextel or iDEN. DUAL BAND: FCC and IC approved for use with all North American cell phones operating on 850 or 1900 MHz (except Nextel or iDEN). Application: One room in a condominium, apartment, home, office or dorm room (up to 2,500 sq. 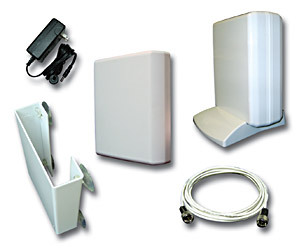 ft.) Range/Performance: Wirelessly enhances signals of multiple cell phones in a room Advantage: Simple do-it-yourself installation does not require tools or outside installation Requirement: 10 separation between window antenna and repeater unit 4KPR-15R System Includes: 3 watt dual band 50dB gain cellular repeater with built-in 9dB gain antenna (DA4000PR) * Window mounted 9dB gain antenna ( 426-PW ) Window mount for 426-PW antenna (DM426) 15 of DA240 cable with attached connectors ( 240- 15NM ) 110 VAC power supply ( DP255 ) * Not sold individually; only available as part of a system. A compact and simple solution to poor cellular reception inside condos, apartments, dorm rooms, homes and offices, the PowerMax™ 4KPR-15R wireless personal cell booster provides reliable and clear cell phone communication equivalent to the cellular signal strength available outside the building. A simple do-it-yourself installation (no tools required) allows this repeater system to be installed in any room with a window. The 4KPR-15R provides clean and clear voice quality and improved air card performance on all carriers except Nextel or iDEN. DUAL BAND: FCC and IC approved for use with all North American cell phones operating on 850 or 1900 MHz (except Nextel or iDEN). * Not sold individually; only available as part of a system.